A oes heddwch? Nac oes! There is is fact some disquiet in bardic circles. 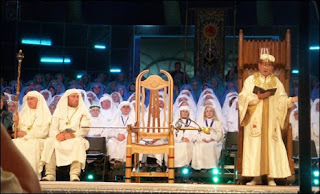 The two main prizes awarded for poetry in the National Eisteddfod of Wales are the Crown and the Chair (there are a number of other prizes for short poems). The winner of the Crown this year was Ceri Wyn Jones. Usually the Crown is awarded for a long poem or sequence NOT written in cynghanedd while the Chair is awarded for a poem in full cynghanedd, conforming to the rules of the strict metres. Some of his fellow bards were surprised, therefore, that the winning poem for the Crown was in cynghanedd. A quick check with the exact specifications confirmed that the words "not in full cynghanedd" did not appear. So the poem was within the rules though not, some argue, in the spirit of the competition. The feeling is that poems in cynghanedd should be for the Chair, not the Crown. Twm Morus characteristically contributed a robust version of this objection which played with images of a squirrel among Welsh Black bulls. All this was compounded at the end of the week when it was revealed that the Chair was not to be awarded as no-one was judged good enough. One of the judges that decided this was Ceri Wyn Jones which was why, he explained, he couldn't enter a poem for the Chair. So disappointment tempered by a feeling that standards are being maintained was the order of the day on Friday. As for the Crown, commentators are predicting that future specifications will ensure that it is spelled out that it is for a poem in the free metres. Ta for this--y gadair wag indeed! Oes cysylltiad 'da chi i gerdd Twm M.? Swn i'n leicio ei gweld. Nid cerdd, ond sylwadau a wnaeth Twm Morys ar ôl y dyfarniad. Roedd adroddiad yn rhifyn Golwg oedd ar werth ar y Maes. Ah, diolch--wna i edrych. Fi'n siwr y bydd y rhifyn 'ma 'da Rhian.